The French National Day commemorates the beginning of French Revolution with the storming of the Bastille on July 14 1789. This day represents the unity, equality and fraternity of the French people at the Fete de la Federation on July 14, 1790. 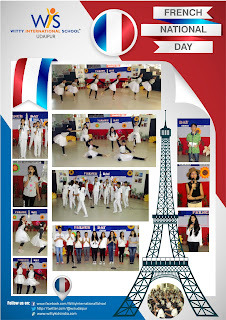 Witty International School, Udaipur conducted an assembly on the French National Day, on 18 July, 2016. Assembly started with a melodious song presented by Witty Choir and was followed by French National Anthem which instilled the air with the essence of French Revolution. Students of Grade VI and VII presented spectacular French Folk dance. A quiz was conducted to evaluate the French knowledge of the students and students of Grade IX recited a brief letter in French which was unique in itself.